Thishemp version of the ever popular Grow-A-Note Partridge in a Pear Treecard by Natalia Martinez incorporates recycling symbol ornaments instead of pears! 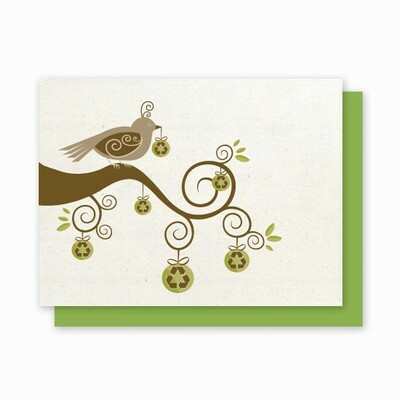 Thisclever card is printed on Hemp Heritage 110# card stock using soy based inks. Hemp Heritage paper is made from fibers of the hemp plant. This historic plant holds great promise as a renewable tree-free source of fiber which can help end the radical destruction of the earth's remaining forests.